Karaoke piracy is being committed way more than most people are aware of! And most people don't really understand what it means nor the extent of the damages done to the industry and the serious consequences for anyone found guilty including the KJs (karaoke operators) themselves and venue owners. Breaking Music Licensing Laws is a very serious offense resulting in hefty fines and/or jail in some cases. Karaoke is popular, and enthusiasts can sing at a dedicated karaoke bar with individual karaoke rooms or booths or choose to sing at one of the many pubs, clubs or restaurants that feature karaoke show nights. Either way— belting out a few tunes with friends with or without alcohol (a little Dutch courage from alcoholic beverages is the norm) is an absolute awesome fun way to chill out. The music’s loud and there’s plenty of high energy pumping through the drunken crowd of late night party revelers and the publican is thrilled with the takings so far— UNTIL one of the patrons that has been quietly watching the evening’s karaoke show unfold; strolls over to the karaoke host and announces he/she’s an APRAAMCOS representative! KJ:"I don't think I have that song but I'll download it for you!" Examining the KJ’s music rig; there is no obvious Music Rights Australia sticker visible as it should be— the music legality police then request to see proof of ownership of the karaoke songs played over the last hour. And asks for details of the music supplier and so on. Bottom line? Not only is the KJ screwed for non-compliance for not being registered, but any breaches of music copyright (illegally obtained music / downloads) can result in fines of up to $60,000 per breach (song). As it turns out karaoke has been featured at the venue every week for two years without the correct license fee ever being paid. That amounts to $19.53 x 104 weeks— total of $2031.12 plus any other outstanding charges that may be applicable. On top of that; there is every chance of being prosecuted under secondary liability for employing a dodgy-KJ! Due diligence is the word here— you need to know exactly who you are hiring! Do your homework & ensure the KJ is registered! 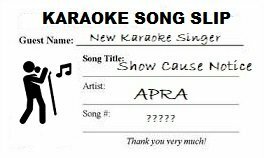 How Many KJs Guilty of Karaoke Piracy in Australia? That’s a great question! I am currently liaising with music rights authorities, venues and legal karaoke hosts to get a real ball-park figure. But let’s just agree that there are far too many KJs operating outside of the law and it’s time to stop turning a blind eye to the fact. My main goal at this stage is to eradicate the KJs that are non-compliant through heavily promoting licensed karaoke operators to every venue throughout the country. I will keep you informed. I estimate that there are a few karaoke operators doing the right thing 100%, but sadly many others are either ripping their karaoke music straight off the internet, purchasing cheap illegal deals or copying discs that are owned by someone else. There are others that may supplement their legally purchased music with the illegal variety to boost the total number of songs they have available.